Yesterday I went along to the opening of Astley Castle, the latest project to be completed by the building preservation charity, The Landmark Trust, which rescues and restores threatened historic buildings and turns them into unique and inspiring places to stay. Strictly speaking Astley Castle is a fortified manor rather than a castle. The Grade II listed building is located on an ancient moated site in Warwickshire and during the 14th and 15th centuries became entangled with the succession to the throne of England through Elizabeth Woodville (wife of Edward IV), Elizabeth of York (wife of Henry VII) and Lady Jane Grey. It is also said to have inspired George Eliot and is believed to be the model for 'Knebley' in Scenes of Clerical Life. During the second world war it was requisitioned for convalescing servicemen and it was later turned into a hotel before suffering fire damage in 1978 and falling into ruin. For many years no solution could be found to give it a viable future. 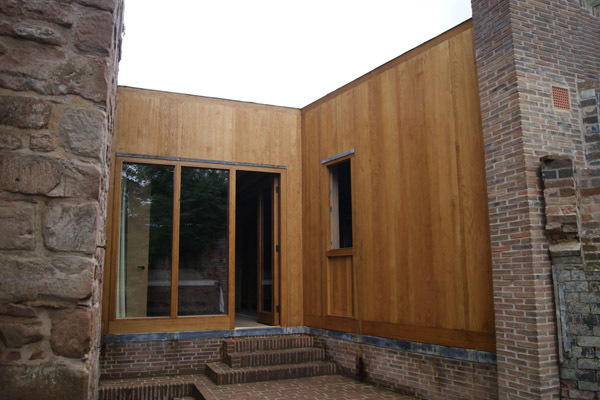 The Landmark Trust first considered taking on the site in the late 1990s, initially proposing their usual solution of conventional restoration and conversion for holiday lets, but the site was so complex that this approach proved impractical, both technically (there were no internal finishes or fixtures left to restore) and financially. In 2005 they proposed a more radical solution: to reinstate occupancy of Astley Castle in a manner appropriate for the 21st century. The architectural brief accepted that some parts of the castle were beyond restoration, but sought to create good modern accommodation within the ancient ruins. 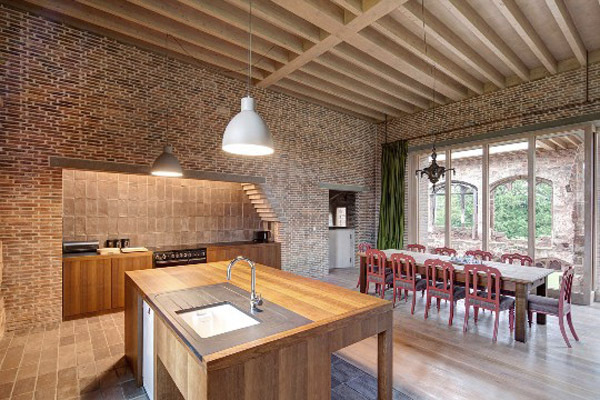 The completed scheme by Witherford Watson Mann offers modern accommodation that is unashamedly, but sympathetically, stitched into the ancient fabric of the building and offers stunning views both into and out of the castle. The unequivocally modern brickwork offers a striking contrast to the original sandstone structure rather than attempting to blend into it, and I found this melding together of old and new slightly reminiscent of nearby Coventry Cathedral. At Astley, as at Coventry Cathedral, the combination of the emotional power of the ruins and intelligent modern architecture is a powerful and thought-provoking experience. However whereas at the cathedral the new is joined onto the old, at Astley it literally sits within it. On the ground floor there are four simply but comfortably furnished bedrooms, which can accommodate up to eight guests, and several bathrooms. These include a bedroom and bathroom suitable for disabled visitors and there is also a lift. Quality materials and a high standard of craftsmanship are present throughout, giving the building a solid, minimal feel that instils a sense of calm. This is most evident in the huge open plan kitchen and living area that occupies the first floor, from where floor-to-ceiling windows look out over Astley's former collegiate church and into beautiful internal courtyards formed by ruined spaces. This is a building where 21st century design is far more in evidence than at most other Landmark Trust properties, which include lighthouses, follies, castles and old mills. In keeping with trust's ethos however, there is no TV or telephone and the property is therefore likely appeal to those seeking an escape from the distractions of modern life as well as those lured by the fascinating history and inspirational architecture. Astley Castle is located near Nuneaton in Warwickshire, sleeps up to 8 people and costs from £1,206 for a three-night weekend break. For booking enquiries contact The Landmark Trust. Images 2,6 and 7 courtesy of The Landmark Trust. All other images by Design Hunter.